Leah Brewer, Matthew Socci, and Zoë Pike in Sun and Room. Photo by Hannah Mae Bernat. 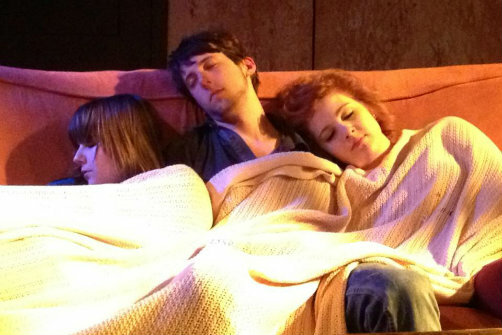 BOTTOM LINE: A new play about the tension between sexual attraction and friendship in college. College romance and friendship can be awkward, and there is plenty of awkward in Danny Mitarotondo’s new play about three friends who try to throw a rockin’ party but end up spending a pretty intimate night with each other when no one else shows up. Like all college parties, there is plenty of booze, dancing and the perpetual possibility of hooking up. But like most college parties, the booze runs dry, the dancing stops, and kids return to their lives unsatisfied. That’s pretty much the way it goes here. Mitarotondo’s play is a touching comment on what happens when sexual frustration meets genuine friendship. The characters struggle with what they want to be to one another: sexual partners, friends or even family. And though the play is only 90 minutes long and takes the course of one night from dusk till dawn, sometimes it feels as though the sun is never going to rise. While drinking and dancing usually make for a wild evening, it’s not quite as much fun to watch others doing it. Sometimes we’re invited to watch the characters listen to whole songs on their computers and phones before the action resumes. The cast is transplanted from Fort Lewis College where they originated their roles. Mitarotondo wrote this play for them when he served as a visiting professor of playwriting there. I gather he based his characters on the actors themselves as each character shares a name with the respective actor. It’s very clear that Leah Brewer, Zoë Pike, and Matthew Socci are having the time of their lives in their New York City premiere as they get wasted, banter, and experiment with baring their bodies. Pike enjoys the lion’s share of hilarious one-liners, while Brewer and Socci struggle with an attraction for one another that is clearly doomed to end in friendship. The set and lighting design, both by Alicia Laws, shine, as it were. The scene is a beautifully carpeted basement, fully equipped with washer and dryer, that makes you want to kick your shoes off and fold some laundry, that is until Socci pukes his guts out on it. Laws really shows off her talent as her lighting design guides us through an entire night in 90 minutes, from early evening to sunrise. Her imitation of natural light comes in through two small basement windows, and yet the variety of looks that she manages to capture through the course of the play knows no bounds. This is a designer who understands how to create a visual journey, and I look forward to seeing what she can do with a larger inventory and budget. College students and recent grads will clearly relate and appreciate this tale of awkwardness, sexual frustration and camaraderie. Those of us well settled in our adult lives may not want to be reminded of it.